And via Android APP the connection for Authentication is extreme slow... Maybe Alexa get an time out cause of extreme slow gateway? After busy yesterday afternoon it seems to be working now. Alexa doesn't work any more. Well, for me Alexa fails once a week. or more often. Personally I think that is not a good service. Is it possible to get these apps to re-connect to a working server when one of them goes offline. A suggestion that might be a high priority request. Otherwise I think z-way is getting better. Alexa hasn't worked for me in quite some time. I see new servers were added, I see my zwave RPi2 connecting to the servers and and authorizing their keys to the know lists. But the connectivity and reliability hasn't increased. Seems to be after Alexa update, that you can add new devices? I must create all from scratch new and i doesn't use the interface from alexa app for some weeks. 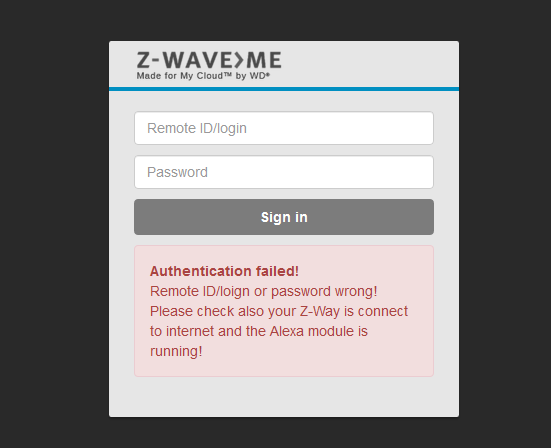 I try now to finde devices, but i can't find any zway devices. Amazon still can connect to server without any issue...Via My Smart Home Skills and Z-Way Smart Home i get the Skill and via Settings i get a connected status. Now how can i find my devices??? I have uninstalled Alexa in my Ios device. Then my friend told me that you can install Amazon Alexa. Even I tried that to do, but that doesn't work. All I tried was to reboot my Ios device. Do you have any Ios device key to run the applications? I can't get this to work. It seems as though Alexa isn't intrepreting what the app is sending. I can authenticate with find.z-way.me just fine, I can add the alexa app and alexa skill just fine, but alexa does not detect any new devices. So clearly alexa can communicate with my zway server, yet it's not returning any devices. Any ideas?